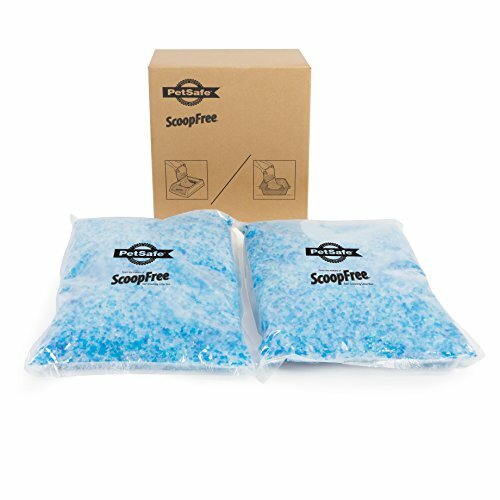 The PetSafe ScoopFree Premium Blue Crystal Litter 2-Pack comes with two pre-portioned bags of our original scent crystal cat litter. The crystals absorb moisture on contact to quickly remove odors instead of masking them, and can be used with any litter box or as refills for the PetSafe ScoopFree reusable litter tray. When used with the PetSafe ScoopFree Self-Cleaning Litter Box and Reusable Litter Tray, one bag can last up to 30 days in a single-cat household! Place the new ScoopFree litter box next to your cat's current litter box, allowing her to have access to both boxes for at least a week. Add a few handfuls of your cat's old, unused litter to the new crystal litter tray. You can also add some of the crystal litter to their current box. Stop cleaning your cat's old litter box, allowing it to remain dirty. Cats prefer a clean litter box, so this will help make the new ScoopFree litter box more appealing. Place the ScoopFree litter box away from areas of high humidity, such as bathrooms, showers, and basements. Since the crystal litter controls odor by absorbing moisture, having extra moisture in the air will shorten the life of the tray. Try placing it in a room with moving air to pull away moisture, like a room with a fan. Cats with diets that are high in crude fiber and ash content will produce more solid waste, which can prematurely fill the waste trap. Consider changing your cat's diet to a food with no byproducts or fillers.